The new service comes at a time when transaction fees on the Bitcoin network are reaching all-time highs. This is not the first time that bitcoin wallets have offered discounted transaction fees. “Many wallets have previously paid for transaction fees on behalf of users, but stopped doing so recently (such as Coinbase and Xapo),” said De La Torre. BTC.com is currently the only bitcoin wallet that also serves as a fully operational mining pool, currently controlling approximately 7 percent of hash power on the Bitcoin network. The Bitcoin community has been embroiled in arguments over the best solution to scale the network for years now. Perhaps the most popular solution is Segregated Witness, a soft fork protocol upgrade proposed by the Bitcoin Core development team. 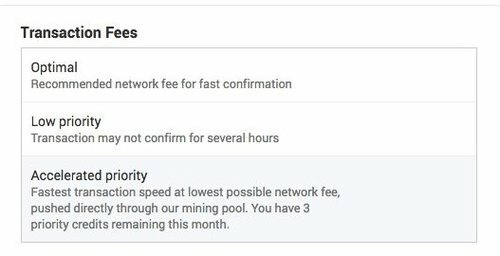 Bitmain in particular has explicitly stated their refusal to implement SegWit if it’s not combined with a hard fork increase of the block size limit, and its pools — which include the BTC.com mining pool — have enough signaling power to block SegWit’s activation. As for solutions to the scalability issue, “BTC.com is supporting Segwit2x.” Segwit2x is a hybrid of the solutions proposed above: It implements SegWit followed six months later by a hard fork increase in the block size limit from 1 to 2 MB.